Common problems and challenges face owners of commercial flat roofing systems. Like if the roof doesn’t have the correct slope, you’re going to have drainage issues. Which, if not corrected quickly, will cause leaks and possible mold growth. The seals have to be watertight in order to fight this issue. One thing that can be utilized for a watertight flat roofing system is rubber or plastic underlayment. Obviously, no one wants water ponding on their roof. One other option could be to construct your roof with both flat and pitched sections in a way that diverts the moisture correctly. If you want your flat roof installed correctly and maintained properly you’ll need to use tested and proven materials and processes. There are some assumptions about flat roofing that are just not true. One item thats cited by building owners and property managers when deciding against a flat roof is the regular maintenance thats required. When the roof is installed right, with the best materials, regular maintenance will not be an issue. Our Texas weather is ideal for having a flat roof on your property. Pitched systems have as much as double the surface area compared to flat roofs. Flat roofs help to insulate a building by reflecting the sun’s rays on warm days and insulating from the cold on winter days. This will lower your utility expenses all year round. There are certain things you will have to do to take care of your flat roof. Water repelling membranes and correctly installed drainage systems will need to be utilized, unlike with pitched roofs, where the slope and gravity itself can be used to shed water, snow and debris. Calling a roof “flat” is somewhat of a misnomer because if it were truly completely flat, water would pool on it every time it rained or snowed. A more truthful description of a flat roof is “low slope”. Water needs to flow into the drainage areas and then off the roof so most commercial flat roofing systems will have a minimum of 1/4 inch of slope per foot. Single Ply – These are constructed from plastics, rubber or a combination of each. In single ply, the membrane is installed in a single layer, as the name implies. It has every simple installation process – heat or weld between the sheets, glue or chemically bond the together, attach this membrane to the roof with an adhesive, some sort of ballast like rocks or with plates and screws. Modified Bitumen – This roof type is constructed of felts and reinforced asphalt. The performance and durability of the roof is built by modifying the felts with polymer or plastics to improve its flexibility. Then it can be applied in a single layer, due to the polymers, and having the seams overlapped. Torches are then used to melt the asphalt underneath it, which glues it to the roof. Rock granules or a liquid coat is then applied to protect these surface materials. Polyurethane Foam – This puts a protective coating on the roof by spraying it on, where it will “foam up” and harden. Roofs that have unique shapes and architectural configurations are great candidates for this type of roof because of its flexibility. It has several advantages over other kinds of flat systems. It will lower your utility bills more than others because of the way it protects your building against thermal shock. Built-up Roofing – “Hot tar roofing” or BUR is one of the older time-proven types of flat roof systems. Hot asphalt is used to fuse together the overlapping layers of felts. Reflective coatings, mineral or rock granules or a coat of asphalt is applied after the initial felt application to protect the system from extreme weather., the sun’s rays and people walking on it. Cool Roofing – This type of roof has a bright white layer applied on top of it. This reflects the suns rays and heat, keeping the buildings utility expenses under control. As temperatures fall and rise, the coating will contract or expand. This will lower your utility expenses and keep the environment in your building comfortable by keeping the buildings temperature either cooler or warmer, depending on the season. PVC and TPO are both very reflective materials. They will help you save money on your utilities by reflecting as much as 90% of the sun’s heat back into the atmosphere. Because of this they are both rated positively for their Energy Star properties. One negative though, due to it being so white in color, is the dust and dirt that will accumulate over time. Their reflective ability and energy efficiency will be somewhat affected by this. The energy efficiency of your flat roof will be lengthened by routine maintenance schedules applied to your white membrane. Due to recent technology advances, there are now many darker colored membranes that also reflect the sun’s rays well. Check the manufacturer’s specs for your material’s to check for its energy efficiency info. The two materials that have the lower energy ratings are EPDM and modified bitumen. Your HVAC system will work harder because these darker materials can warm as much as 170 degrees in the summer months. 10 to 15 years is about how long an EPDM roof should last. The warranties on a flat roof won’t cover water ponding or failing seams, even though they can be as long as 40 years. On a roof with rubber or plastic membranes, these are the two main reasons for failure. Problems with a membrane’s materials and installation can make a TPO’s roofing system’s life expectancy fluctuate. The life expectancy ranges from 7 to 20 years. TPO roofing installations can be warranted for as long as 20 years. The material that has the longest life span is PVC. It withstands thermal movement through its heat-welded seams, which keeps it flexible. 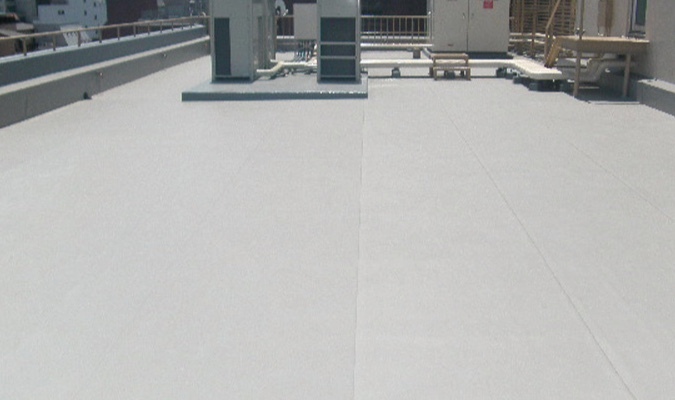 A commercial flat roof made with PVC can last 30 years or longer. Commercial installations can be warranted for as long as 25 years by the manufacturer alone. PVC Has the longest lifespan of these materials. PVC has heat-welded seams, allowing it to keep its flexibility during its lifespan and withstanding thermal movement. A PVC commercial flat roof can have a lifespan as long as 30 years or more. Manufacturers will offer a 25 year warranty for commercial installations and some have lifetime warranties for residential installations. Tar & Gravel roofing, in addition to modified bitumen, will last from 10 to 20 years. One of their biggest drawbacks, however, is that when they are torn off and removed, it can add a lot of expense to the process. Another issue, is there are no longer a lot of commercial roofing contractors that install this type of roof and have experience with them. How long they last depends a lot on how well they’re initially installed. You’ll need to find a commercial flat roof repair contractor that has experience with it when you need to have it repaired also. Choosing someone that specializes in singe ply roofing wouldn’t be a good choice to repair your modified bitumen or BUR roof. With single ply, the type of warranty you’ll get will depend on the several things – your environments conditions, the size of the roof, the methods used to install it and the thickness of the materials used. Employ due diligence when comparing the warranties available for the type of flat roofing system you choose. Taurus Elite Commercial Roof Systems, 512-332-4422, provides commercial roofing services to Austin, Texas and the surrounding communities. This includes commercial flat roof repair, commercial flat roof replacement and commercial flat roof installation. 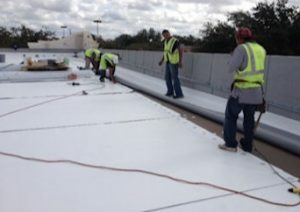 We have been providing professional commercial roofing services in Texas for over 20 years. When you need an experienced, trustworthy commercial roofing contractor to help you with questions about your flat roofing system, give us a call. I'm proud to say no one can beat our quality, pricing and experience in commercial metal roof repair and restoration throughout Texas and the entire Southwest. Taurus Elite Commercial Roof Systems is online and connected to our customers. Please engage with us at any of our social media sites below. Copyright @ Taurus Elite Commercial Roof Systems. All Rights Reserved.